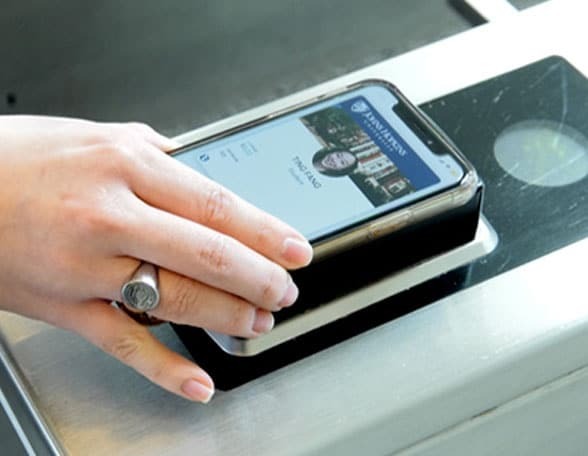 Students, as well as JHU faculty and staff members, can add their J-Card identity card to the app and use their iPhone, Apple Watch or Android phone to gain access to buildings and services or to pay for food. The J-Card Mobile Credential works as part of the eAccounts Mobile app developed by Blackboard. It is open to all full-time students on JHU’s Homewood campus in Baltimore, Maryland, as well as to faculty and staff with an iPhone 6 or later, Apple Watch or Android device running version 5.0 or newer. Once the user has logged into the app using their existing JHU details and authenticated their device, they can view details of their J-Card account. This includes J-Cash, Dining Dollars and dining plans along with history of any transactions made. Apple users can also use the app to add further funds. while Android phone users have to do this via their mobile browser instead. When users want to gain entry to a building, they simply tap their device on a reader. It gives them access to halls of residence, the campus library and the recreation centre, and enables them to print documents, shop at the university bookstore and buy meals at campus dining facilities. The digital ID will also work at a number of off-campus businesses including Eddie’s, Pete’s Grille, Chipotle, 7-Eleven, CVS and Insomnia Cookies. “Offering a digital ID option reflects our continuing commitment to enhance the services provided to students,” says JHU’s vice provost for student affairs Kevin G Shollenberger. Duke University in North Carolina and the Universities of Alabama and Oklahoma were the first to roll out the app at the beginning of October 2018.